Cosmoem in game: 98 Who? Important notice! Pokemon Cosmoem is a fictional character of humans. Cosmoem (Japanese: ????? Cosmovum) is a Psychic-type Legendary Pokémon introduced in Generation VII. It evolves from Cosmog starting at level 43 and evolves into either Solgaleo or Lunala starting at level 53 depending on the game it evolves in. In Pokémon Sun, Cosmoem evolves into Solgaleo. In Pokémon Moon, Cosmoem evolves into Lunala. 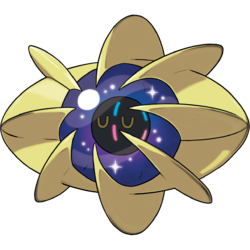 Cosmoem is a Pokémon in the shape of a translucent, dark blue orb with a starscape pattern set in a gold-colored structure, which is comprised of four ellipses intersecting each other in an asterisk shape and another intersecting the former four along the middle. At the center of the main body is a much smaller black core with a blue and a pink marking on the front and an orange semicircle on both sides, giving it the appearance of a sleeping face. The shape also looks like an eye. 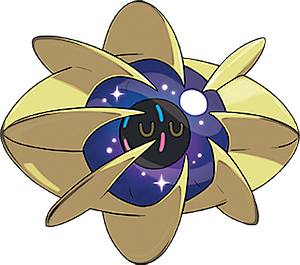 Pokémon Sun and Moon: Nebby (Japanese: ??????? Hoshigumo-chan), the Cosmog that travels with Lillie, eventually evolves into Cosmoem after being forced to open an Ultra Wormhole by Lusamine. At the Altar of the SunneS/Altar of the MooneM, the player and Lillie play the Sun and Moon Flutes, causing Nebby to evolve into SolgaleoS/LunalaM, where it eventually officially joins the player. Moves marked with a superscript game abbreviation can only be bred onto Cosmoem in that game. At 2204.4 lbs. (999.9 kg), Cosmoem is tied with Celesteela as the heaviest Pokémon. At 4 inches (0.1 m), Cosmoem is tied with Joltik, Flabébé, Cutiefly, and Comfey as the smallest Pokémon. Cosmoem and its evolutionary relatives are the only Legendary Pokémon that are part of an evolutionary family. Cosmoem has characteristics of both a stylized sun and a stylized moon, having rays and a pair of crescents, respectively. Given its description, it seems to be an embodiment of star formation in general. It may also be based on the idea of the world egg. When viewed from the front, its shape resembles an eye. Cosmoem may be a combination of cosmo and embryo. Cosmovum may be a combination of cosmo and ovum (Latin for egg).